She ain’t exactly pretty… Ain’t exactly small… She’s a whole lot of… Pudding Cake? Please tell me you guys get the reference. They may not be the most ingenious band ever, but I will always have a place in my heart for AC/DC. Such a sad looking cake. And a terrible photograph to boot. Just trust me on this one…. Back to the cake. 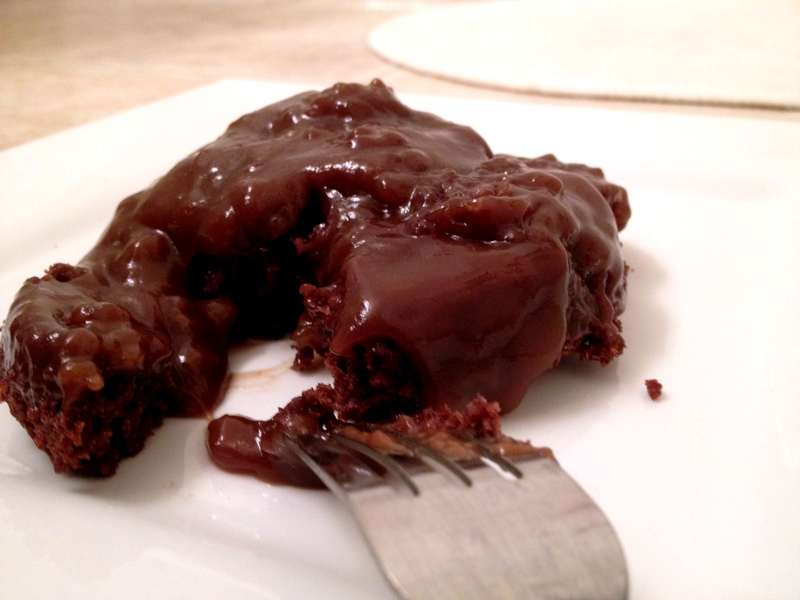 Chocolate Caramel Upside Down Pudding Cake, to be exact. This cake may not be the prettiest (it may, in fact, be one of the ugliest) of desserts, but trust me, its delicious. Not to mention cheap and easy (I swear I am referring to the cake). It only requires 2 small bowls, 10 minutes of prep time, and 25 minutes in the oven. The caramel sauce is like magic. It literally makes itself in the oven; no need for a candy thermometer or a pot of boiling-hot napalm-esque sugar water. You pour in the cake batter, top it with the caramel ingredients, and, as it bakes, the caramel thickens and sinks to the bottom. When you invert it, the result is a warm, gooey chocolate cake with a thick, dark caramel sauce that oozes over the plate. It doesn’t look like much, but it tastes heavenly. I created this recipe for my boyfriend. 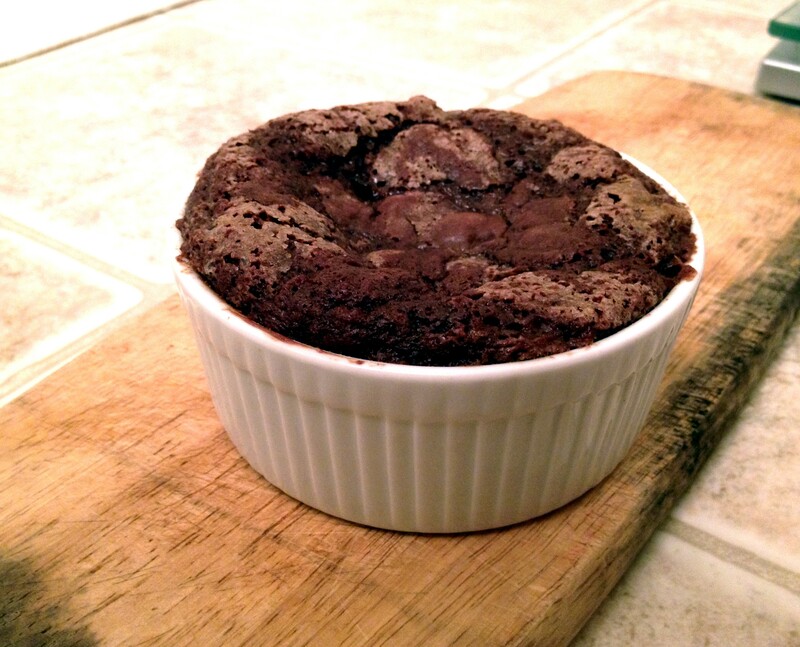 He noticed several chocolate pudding cake recipes on my blog feed (it seems to be in right now) and kindly requested I make one for him. Imagine a puppy face and “Please please please”. Yeah, I can’t really say no to that. To be honest, I can’t really say no to any baking requests. I love any excuse to mess around in the kitchen (seriously, I’m not trying to sound dirty, sometimes it just happens). But I wanted to do something a little different. Instead of chocolate on chocolate, as Brown Eyed Baker and Chocolate Covered Katie make, I went for caramel and chocolate. Yes, their dishes look infinitely more enticing in the pictures than mine, but mine has delicious, sweet, golden(ish) caramel. Don’t judge a book by its cover. Yes I know I’m trying a bit too hard here, but seriously, this cake is way better than it appears. 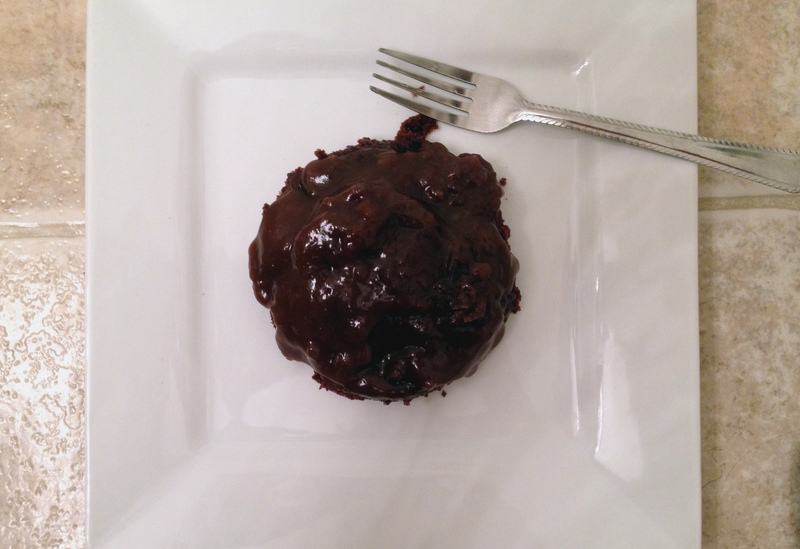 Because I didn’t want an entire pan of chocolate pudding cake (because I know we would finish it), I quartered the recipe to make a cute, little two-serving cake. Before I inverted the cake to serve. You can’t see the caramel here, but, hey, at least it looks like cake. Or, what I thought would be two servings. I managed to snap two pictures and take one forkful before my boyfriend gobbled it up. Seriously, 30 seconds flat. Sigh. Oh well, I can’t really be mad. In reality, I take it as a compliment. After all, it’s quick and easy enough to make again any day of the week. But maybe next time, I’ll make one just for myself. 1. Preheat oven to 350F. Grease a 10 ounce ramekin. Add milk, melted butter, and vanilla. Stir until well combine and spread into greased ramekin. In a small bowl or cup, combine cornstarch and brown sugar with a fork. Mix until no clumps remain. Sprinkle evenly over cake mixture. Heat water in a 2-cup glass measuring cup in microwave until boiling, approximately 2 minutes. Stir in corn syrup and honey. Pour evenly over cake batter and cornstarch mixture. Bake in preheated oven 25 minutes and let cool 15 minutes. Run a pairing knife around the edge to loosen cake from edge of ramekin. Place a plate over the ramekin and invert cake on to plate and serve.